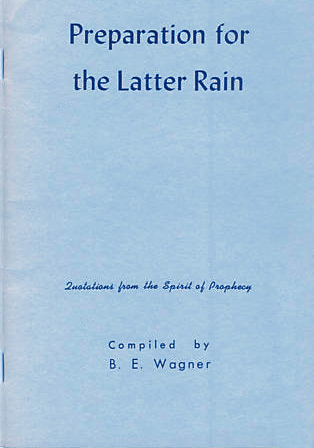 The following compilation of statements from the Spirit of Prophecy by Elder B. E. Wagner was used in connection with studies given in several churches. There were so many requests for copies of these that he thought he would make them available. A wider distribution of this was encouraged by such men as H. M. S. Richards, N. C. Wilson, R.A. Anderson, Miller Brockett, and others. Just recently he presented this series in Prayer Meeting at the University Church. We are happy to make this compilation available for those who wish to study this most important subject. As we approach the time of the fullness of “The Latter Rain,” we surely want to be prepared. We trust this will be a blessing to all who read it. The great controversy between Christ and Satan is nearing its culmination; Satan is marshalling his forces for the last act in the drama of human history. Inasmuch as the coming of Jesus has been delayed for so many years, should we not at this time give diligent, prayerful study to the real cause for this long delay that we may prepare quickly to hasten His coming? Christ the True Witness (Rev 1:5) has sent a message to the Laodicean church, which if heeded will prepare us for the Latter Rain. The Laodicean message is a “startling denunciation” (3T 252) yet it is a message of love. It is an appeal of love from the great Lover. If we heed the counsel of the True Witness and open the door of the heart so that Christ by His representative, the Holy Spirit, can come in, we will receive Divine power to overcome every besetment and enjoy the great privilege of sitting down with Christ in His throne. Let us give prayerful study to the following statements from the pen of God’s messenger on this most vital subject upon which hangs our eternal destiny. Why is the Remnant not prepared to give the third angel’s message with great power during this late hour of earth’s history? The following quotations reveal the strategy of the enemy. One third of the angels of heaven were deceived. Eve and Cain, her firstborn, were deceived. All but eight were deceived at the time of the flood. Many of the religious leaders at the time of Christ were deceived, even though they witnessed the Son of God perform some of His greatest miracles. Let us ponder these divine comments on the message to the Laodiceans. But, many do not appreciate the fact that they must have the heavenly unction. “The name ‘foolish virgins’ represents the character of those who have not the genuine heart-work wrought by the Spirit of God. The coming of Christ does not change the foolish virgins into wise ones . . . .
EW 270 “I asked the meaning of the shaking I had seen and was shown that it would be caused by the straight testimony called forth by the counsel of the True Witness to the Laodiceans. This will have its effect upon the heart of the receiver, and will lead him to exalt the standard and pour forth the straight truth. Some will not bear this straight testimony. They will rise up against it, and this is what will cause a shaking among God’s people. 7T 16, 17 “Upon us rests the weighty responsibility of warning the world of its coming doom. From every direction, from far and near, are coming calls for help. God calls upon His church to arise and clothe herself with power. Immortal crowns are to be won; the kingdom of heaven is to be gained; the world perishing in ignorance, is to be enlightened. What a glorious opportunity! I am sure that with me you will determine to give treed to the Laodicean love message, die to self daily, permit the Holy Spirit to have full control of your life that you may be speedily prepared for the Latter Rain and act your part in giving the message with compelling power during the Loud Cry. This message began on time in fulfillment of prophecy, and it is going to be finished. God will finish the work (Rom 9:28) with you and me, if we will, or with others if we will not. DA 296, 297 “Man needs a power outside of and beyond himself, to restore him to the likeness of God, and enable him to do the work of God; but this does not make the human agency unessential. Humanity lays hold upon divine power, Christ dwells in the heart by faith; and through cooperation with the divine the power of man becomes efficient for good. Satan will seek to prevent the outpouring of the Holy Spirit by introducing a counterfeit (Read GC p. 464). For many years we have seen many evidences of the counterfeit. Inasmuch as the hour is so late, should there not be abundant evidence of the genuine? The greatest need of the world today is to see manifestations of the transforming power of the Holy Spirit in the lives of those who profess to be giving the last warning message. For years many have felt this need. Here are a few statements taken from a series of lectures on Evangelism given in 1952 by William Ward Ayer to a large group of theological students at Bob Jones University. (Printed in a book entitled Flame for the Altar). “In this solemnly tragic hour, this crisis time of history. . . the Church is passive, waiting like the impotent man at the Pool of Bethesda . . . .
“The need of the churches, therefore, is the spirit and the power of Elijah. They must submit themselves to the Lord God of Elijah until He imbues them with that spirit and power . . . . The following quotations from the Spirit of Prophecy, reveal why the Latter Rain has been so long delayed, and what we must do in preparation to give this message with great power. The Holy Spirit in the Early Rain purifies and transforms us until we overcome and gain the victory on every point. This is the preparation we must make before we are ready to receive the Latter Rain. Those who do not die to self daily and let the Holy Spirit purify and transform their lives, will not recognize or understand the manifestations of the Holy Spirit in the Latter Rain. They will be shaken out and their places will be filled by others taking hold of the truth and uniting with God’s commandment-keeping people. 5T 216 “It is now that we must wash our robes of character and make them white in the blood of the Lamb. It is now that we must overcome pride, passion, and spiritual slothfulness. It is now that we must awake and make determined effort for symmetry of character. ‘Today if ye will hear His voice, harden not your hearts.’ We are in a most trying position, waiting, watching for our Lord’s appearing. The world is in darkness. ‘But ye, brethren,’ says Paul, ‘are not in darkness, that that day should overtake you as a thief.’ . . . The hour is very late. We must not delay, Israel spent 40 years wandering in the wilderness when she could have gone to the promised land in two weeks. When God’s people are prepared for the Latter Rain, the work of God will be finished in a very short time. Our greatest need is a daily anointing of the Holy Spirit to prepare us for the Latter Rain. The following quotations reveal how dependent Christ was upon His Father. He is our example. And Jesus says to us, “Without me ye can do nothing’ (John 15:5). If Jesus the Son of God needed a fresh baptism of the Holy Spirit daily, what about you and me? Since Christ is our example in all things (Steps to Christ, p. 97), we must experience the indwelling of the Holy Spirit daily that we may be fitted for the conflict. What will the Holy Spirit Do For Us? What was the measure of Christ’s love? While He was being nailed to the cross, He prayed for His murderers, “Father, forgive them for they know not what they do.” “Oh, what love! what wondrous love!” “Let this mind be in you, which was also in Christ Jesus.” When we love as Jesus loved, the Holy Spirit will use us to supply the world’s greatest need. What a responsibility! What a challenge! What a privilege! By the mighty power of the Holy Spirit we are to reveal God’s character of love and manifest His glory. The only way to accomplish this is to die to self daily and experience daily a baptism of the Holy Spirit. When we fully submit to His power, the Holy Spirit will consume sin in us; purify, refine, and transform us until the countenance reflects the light of heaven. The Holy Spirit creates a new being in the image of God. God’s love will be revealed. Then we will be prepared for the Latter Rain and the Loud Cry. AA 22 “After the descent of the Holy Spirit, the disciples were so filled with love for him and for those for whom He died, that hearts were melted by the words they spoke and the prayers they offered. They spoke in the power of the Spirit; and under the influence of that power, thousands were converted. COL 402 “Without love to their brethren, without humility before God, they are nothing . . . .
What is this vital message that God wishes to communicate to man? Listen to His voice in Jer 9:23, 24: “Thus saith the Lord, let not the wise man glory in his wisdom, neither let the mighty man glory in his might, let not the rich man glory in his riches; but let him that glorieth glory in this, that he understandeth and knoweth me. 8T 329 “The knowledge of God that works transformation of character is our great need. If we fulfill His purpose, there must be in our lives a revelation of God that shall correspond to the teaching of His word. God revealed His love through faithful Enoch before the world was destroyed by water, and now He desires to reveal His love through His people before the world is destroyed by fire. A manifestation of the love of God is the greatest need of the world today. “The experience of Enoch. . . represents what ours should bet, (8T 329). If we crucify self daily, surrender ourselves to God for service withholding nothing, pray constantly for a daily anointing of the Holy Spirit, our faces will become radiant with a holy light, and others will behold the impress of heaven upon our countenances. This program will meet our great need, and the Holy Spirit will use us as instruments to meet the great need of the world. Then the work of God will be finished in a very short time. 8T 331, 332 “John the Baptist in his desert life was taught of God. He studied the revelations of God in nature. Under the guiding of the Divine Spirit, he studied the scrolls of the prophets. By day and by night, Christ was his study, his meditation, until mind and heart and soul were filled with the glorious vision. This is a promise to every one of us. If we meet the conditions as did John the Baptist, our greatest need will be supplied. Then God will use us as instruments to supply the world’s greatest need. God used one man in the wilderness to stir a nation. Soon, yes very soon, He will use a faithful Remnant to move and stir the whole world. If we determine to be among that faithful few, we must make speedy preparation now. The experience of John represents what ours is to be. 8T 332 “Unlearned peasants and fisherman from the surrounding country; the Roman soldiers from the barracks of Herod; chieftains with their swords at their sides, ready to put down anything that might savor of rebellion; the avaricious tax-gatherers from the tollbooths; and from the Sanhedrin the phylacteried priests, —all listened as if spell bound; and all, even the Pharisee, and the Sadducee, the cold, unimpressible scoffer, went away with the sneer silenced, and cut to the heart with the sense of their sins. Herod in his palace heard the message, and the proud, sin-hardened ruler trembled at the call to repentance. The Early Rain is the transforming power of the Holy Spirit, daily infilling the believer’s heart, which brings victory over sin and covers with Christ’s righteousness. The Latter Rain is power for witnessing. It prepares God’s faithful Remnant to give the Loud Cry of the Third Angel’s Message with compelling power. Then the eyes of the world will be focused upon God’s commandment-keeping people. Then the people of God will reveal the love of God, the character of God —the glory of God. Then they will be prepared to stand during the seven last plagues without a mediator. Although the servant of God did not indicate a specific time for the outpouring of the Spirit, she said that at the “commencement of the time of trouble . . . the ‘latter rain,’ or refreshing from the presence of the Lord, will come.” (EW 85. 86) This is the brief time of trouble before the plagues fall. We are near to that time when all mankind will be divided in two classes: those with the mark of the beast and those with God’s name in their foreheads. This will mark the fall of Babylon. This is the real issue. God’s only answer to the worship of the Beast and his image is the image of God restored in the soul and reflected in the life. The time of the test is fast approaching. We must prepare now. GC 591 “Communications from the spirits will declare that God has sent them to convince the rejecters of Sunday of their error, affirming that the laws of the land should be obeyed as the law of God. They will lament the great wickedness in the world and second the testimony of religious teachers, that the degraded state of morals is caused by the desecration of Sunday. Great will be the indignation excited against all who refuse to accept their testimony. 5T 717 “My brethren, do you realize that your own salvation, as well as the destiny of other souls, depends upon the preparation you now make for the trial before us. (Review DA 107 last paragraph: DA 173 first paragraph; and Rom 8:14). This may be the time that Satan will personate Christ. Read GC 622-625. EW 85, 86 “At the commencement of the time of trouble, we were filled with the Holy Ghost as we went forth and proclaimed the Sabbath more fully . . . .
6T 401 “. . .when the storm of persecution really breaks upon us, the true sheep will hear the true Shepherd’s voice. Self-denying efforts will be put forth to save the lost, and many who have strayed from the fold will come back to follow the great Shepherd . . . .
EW 227-279 “I saw a great light resting upon them, and they united to fearlessly proclaim the third angel’s message . . . .
“The glory of God rested upon the patient, waiting saints, and they fearlessly gave the last solemn warning, proclaiming the fall of Babylon and calling upon God’s people to come out of her that they might escape her fearful doom . . . . This is the time when the work of the church will be finished in a blaze of glory that shall enlighten the whole world! EW 279-281 “I saw angels hurrying to and fro in heaven An angel with a writer’s inkhorn by his side returned from the earth and reported to Jesus that his work was done, and the saints were numbered and sealed. Then I saw Jesus, who had been ministering before the ark containing the Ten Commandments, throw down the censer. He raised His hands, and with a loud voice said, ‘It is done.’ And all the angelic host laid off their crowns as Jesus made the solemn declaration, ‘He that is unjust, let him be unjust still; and he which is filthy, let him be filthy still; and he that is righteous, let him be righteous still; and he that is holy, let him be holy still.’ . . .
“As Jesus moved out of the most holy place, . . . a cloud of darkness covered the inhabitants of the earth. There was then no mediator between guilty man and an offended God . . . .
Shall we not do now what many thousands will wish they had done when the plagues begin to fall? Then it will be too late to surrender without reservation and earnestly pray for a daily baptism of the Holy Spirit. Now is the time to put self aside and make speedy preparation for the Latter Rain. TM 310, 223 “Realize every moment that you must have the presence of the Holy Spirit; . . .
Our task is not just to continue in the Lord’s service making large gains year after year. The hour is long overdue when we should let God use us to quickly finish the work by the mighty power of His Spirit. This is the hour of greatest danger. All that will survive the seven last plagues is a holy character. The vital need —the greatest need of the Remnant church is not more members, more preachers, more money, or more facilities. The greatest need today is Spirit filled men and women. We have the greatest literature in the world. We have the greatest organization in the world. Who will respond without reservation to the mighty challenge of this climatic hour of earth’s history? TM 61 “God has a church upon the earth, who are His chosen people, who keep His commandments. He is leading, not stray offshoots, not one here and one there, but a people. The inclination to criticize should be a danger signal to us, for when the Holy Spirit purifies and transforms us, our hearts will be filled with love for God and for our brethren. While it is true that the majority in the Remnant church are in the Laodicean state, many of whom will be shaken out, yet there is in the church a faithful group that will give heed to the counsel of Christ the True Witness. They will be prepared for the Latter Rain, share in giving the message with a Loud Cry, and be ready for translation. This is the Remnant church. God will not lead another movement. When the faithful ones give the message with great power during the Latter Rain, a great multitude will come out of the fallen churches, witness for their Master, and triumph with the redeemed on the sea of glass. Now is the time to prepare for the Latter Rain. And we should remember daily that this work of preparation must take place under the Early Rain. KH 291 “Our future eternal happiness depends upon having our humanity, with all its capabilities, and powers, brought into obedience to God and placed under the control of Divinity . . . .
“Jesus became a man that He might mediate between man and God, . . . . that He might restore to man the original mind which he lost in Eden through Satan’s alluring temptation. AA 49, 50 “Daily they prayed for fresh supplies of grace, that they might reach higher and still higher toward perfection. Under the Holy Spirit’s working, even the weakest, by exercising faith in God, learned to improve their entrusted powers, and to become sanctified, refined, and ennobled. As in humility they submitted to the molding influence of the Holy Spirit, they received of the fullness of the Godhead, and were fashioned in the likeness of the divine. But to finish the work of God, we must receive daily a fresh baptism of the Holy Spirit. 7T 33 “All that the apostles did, every church-member today is to do. And we are to work with as much more fervor, to be accompanied by the Holy Spirit in as much greater measure, as the increase of wickedness demands a more decided call to repentance . . . .